Overlooking the rolling foothills out toward Lake Oroville, the design of this custom home compliments the natural terrain very well. 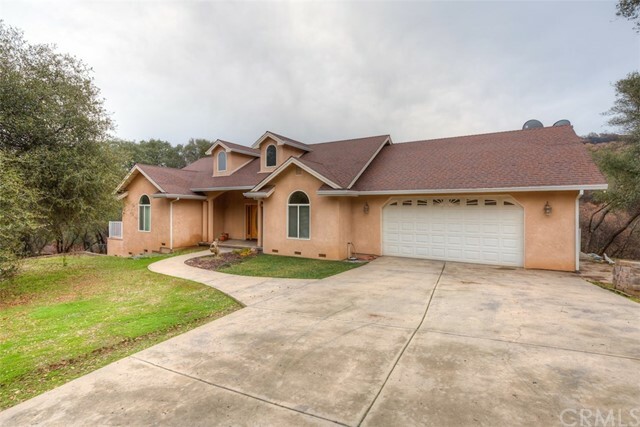 The gated property is located just off the beaten path of HWY 70 & is a quick jaunt into Oroville, Chico & Paradise. Upon arrival to this preserved 12.6 acre piece of land you'll notice the shared driveway with the neighbor who also has a custom home. In this open concept layout you'll find an admirable kitchen with high end stainless appliances and granite counters. The master suite is located on one end of the home and features a huge closet, soaking tub with views of your private land, double vanity and a door out to the back deck. Outside the home you will find a stamped concrete driveway with walkways that trail around the property. In addition to the property being absolutely stunning, the seller is willing to give $10,000 toward carpet and paint! Call today for your private tour!